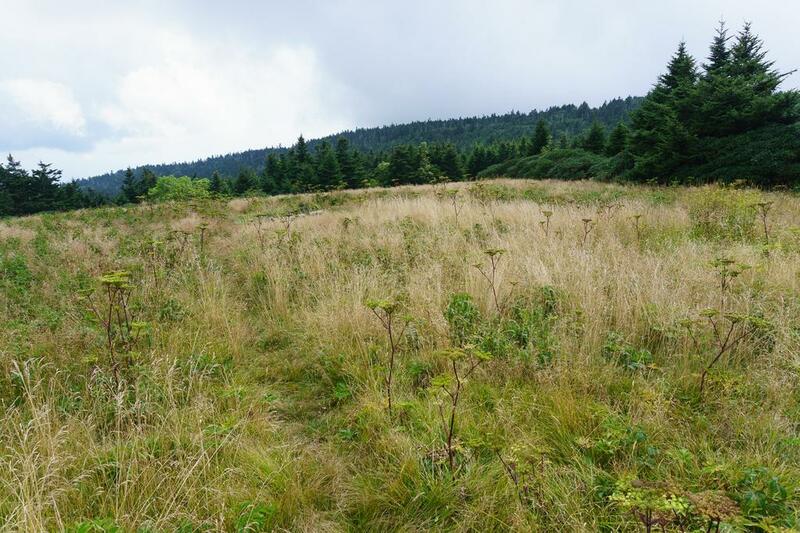 Located on the North Carolina/Tennessee state line, Roan Mountain is actually more of a mountain range about 5 miles long - called a massif - than it is a single peak. 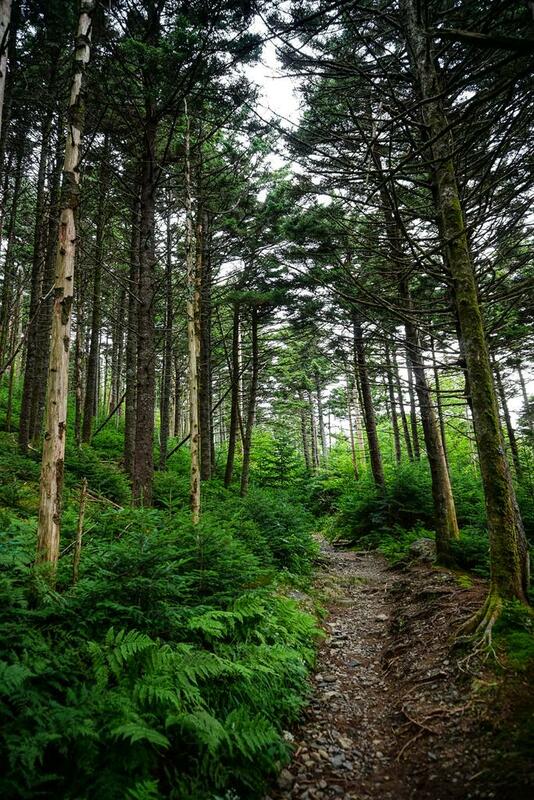 Famous for its Catawba Rhododendron gardens with its brilliant purple flowers in spring, the Roan is a wonderful place to visit and hike any time of the year. Looking back toward Carver's Gap and Roan High Knob from Jane Bald on the Appalachian Trail. The Appalachian Trail heading southwest from Carver's Gap immediately enters a dark forest of Red Spruce and Fraser Fir. Even cross-country skiing is popular here during the winter, owing to the fact that the Roan Massif gets more snow than almost any other location in Western NC. 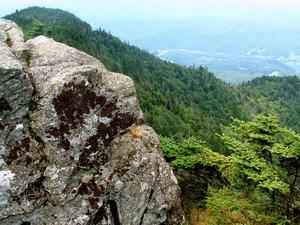 It is one of the highest ranges in the Southern Appalachians, with peaks topping out at over 6200'. 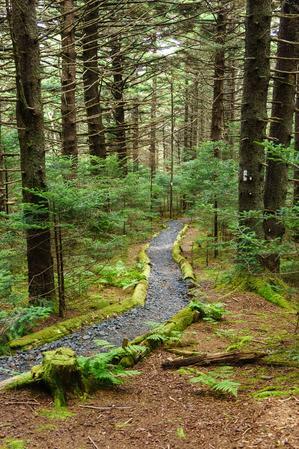 The Appalachian Trail - which is the main hiking opportunity on the massif - traverses the ridgetops while a few other trails wind around the area, including one fully wheelchair-accessible trail through the main Gardens area. 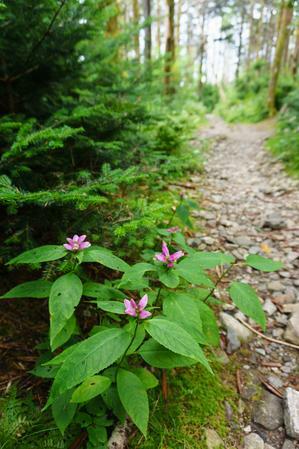 Besides the rhodododendrons, which bloom in mid-June, you'll find the mountain interesting for a variety of other reasons. The massif's balds are probably the next-most interesting feature. These treeless mountaintops offer spectacular views, fields of grass waving in the winds, and an alpine-like hiking experience. In other places, a dense spruce-fir forest grows, some of the healthiest examples of this ecosystem left in the southern Appalachians (since being devastated over the last few decades by the Balsam Wooly Adelgid). A unique historical site, that of the Cloudland Hotel, offers a glimpse into the mountains' past while the mountain's name itself has been subject to legends of origin and historcal debate. So what does "Roan" mean? It depends on who you ask. Some say the name refers to Daniel Boone's "roan" or reddish horse, which he supposedly rode into the area. It could also refer to the reddish appearance of the Rhododendron blooms or of various other wildflowers or berries (such as mountain ash) that grace the mountaintop. Whatever the origin, the name has stuck, and it's official now. 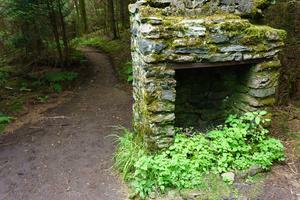 You can start hikes from Carver's Gap, or from inside the recreation area during the warmer months. 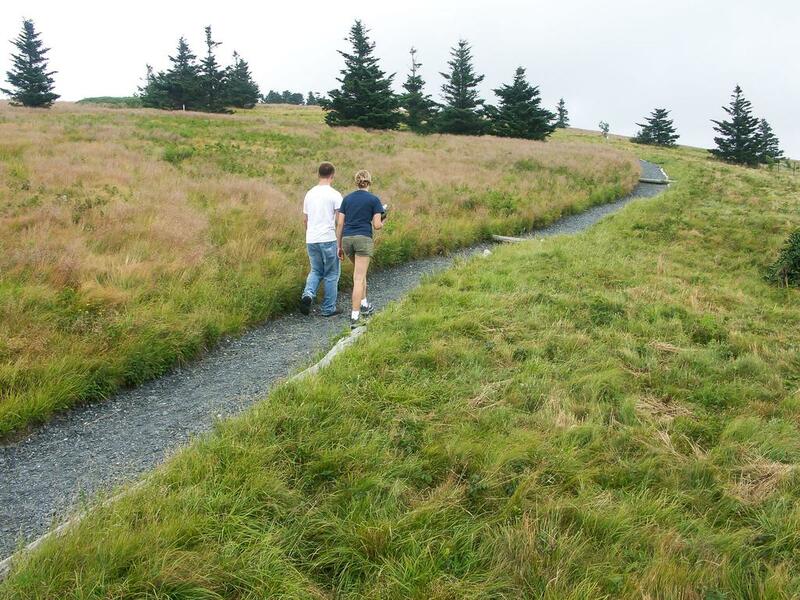 That's when the road to the Roan Mountain Recreation Area opens, providing easy access to points of interest on the summit. A fee is charged to access the recreation area. Here's an overview of what's available from both starting points. Once inside the recreation area, you can visit the ruins of the former Cloudland Hotel, a short walk from the main parking area. Interpretive signs explain the history of the area and provide a view into the past. Restrooms are available there. 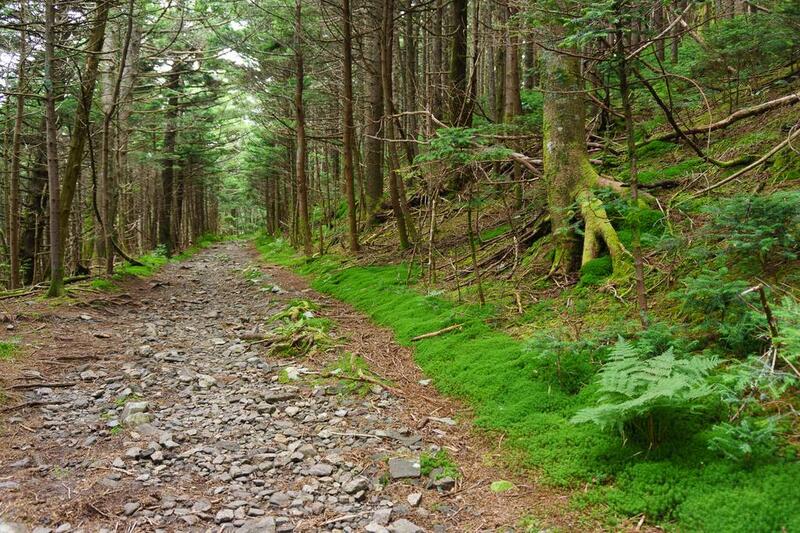 A road travels southwest on the ridge, and provides access to parking at the Roan Mountain Gardens trail, a paved, accessible loop with gentle hills which winds around through a natural rhododendron garden area. Elevated platforms lift you above the shrubs for the best view. The rhododendrons bloom in mid to late June, at which point you'll share the trail with scores of other visitors out to enjoy the spectacle. But this trail does ensure that everyone - regardless of mobility - has access to the spectacular gardens as well as the spruce and fir forests that grow on the mountain. The summit road continues southwest and ends at a picnic area. The parking there puts you a mere 0.5 mi. 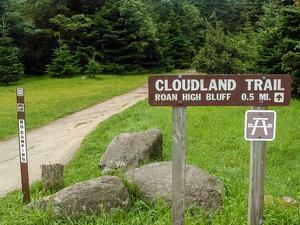 from Roan Mountain's second-highest point, Roan High Bluff, via the last part of the Cloudland Trail. That's the easiest way to get to the viewpoint there. The trail climbs very little from the picnic area (a litle over 100'), and part of it is paved, so nearly anyone can see the view. 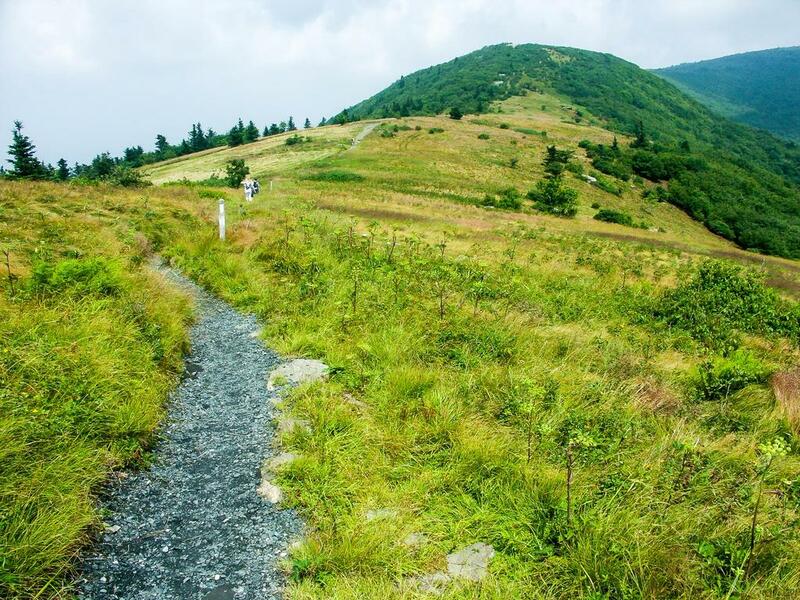 The Appalachian Trail, or segments of it, represents the longest trail for hiking in in the Roan Mountain area and presents both the greatest challenges and some of its most popular stretches. But from Carver's Gap, the A.T. climbs moderately for 3/4 mi. to Round Bald, one of the best examples of a grassy bald environment in the Appalachians with scenic views unfolding in all directions. 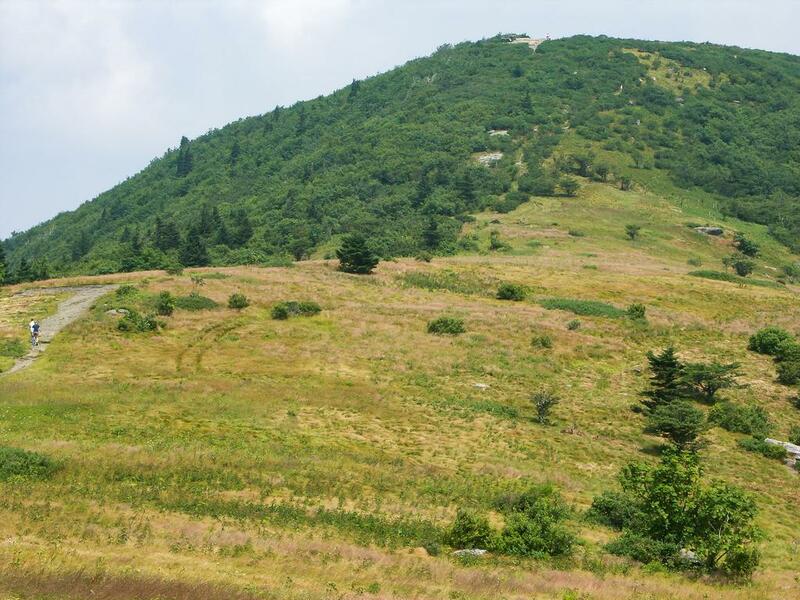 Although it is a 400 ft. climb to the top of Round Bald, it is well worth the effort. The trail is in great shape with an improved, crushed stone surface, and families with energetic kids should find this one quite doable. Bring a kite or a picnic for some extra motivation and something to do when you reach the top! If you're visiting the recreation area but still looking for a bit of a real hike, we recommend parking at the first lot and hiking the entire Cloudland Trail to Roan High Bluff. The trail winds through spruce and fir forests, paralleling the road along the summit of the ridge. 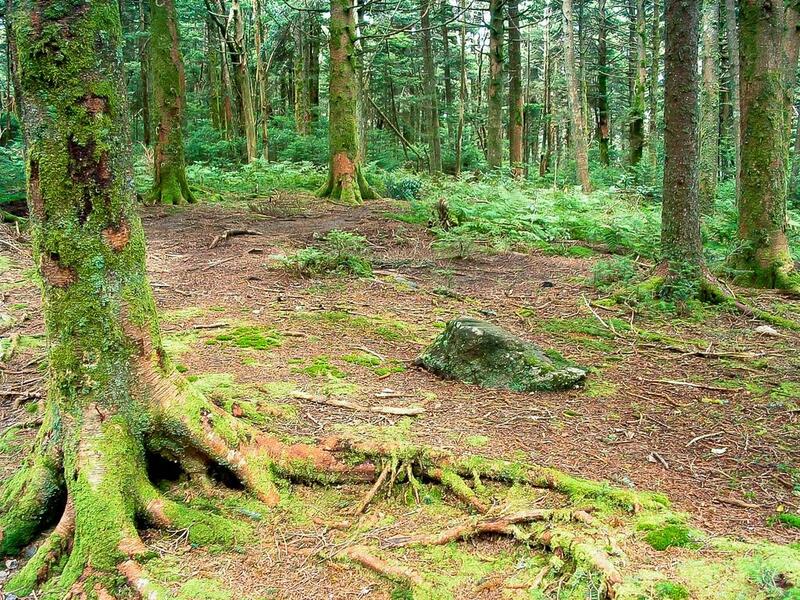 You can access the rhododendron gardens and hike through the picnic area all the way to Roan High Bluff, the second-highest peak on the massif at 6286 ft. The total length is about 1.5 miles, or 3 miles round-trip (closer to 4 if you add in the gardens loop), and is suitable for families with children. The trail is well signed and easy to follow, with gentle climbs. If you head north on the A.T. from the Cloudland Hotel site, it will quickly take you away from the crowds on a beautiful trail through the spruce forest on an old road bed. The Appalachian Trail heading southwest from Carver's Gap, or northeast from the Cloudland Hotel site, goes around Roan High Knob through this beautiful forest of spruce and fir. 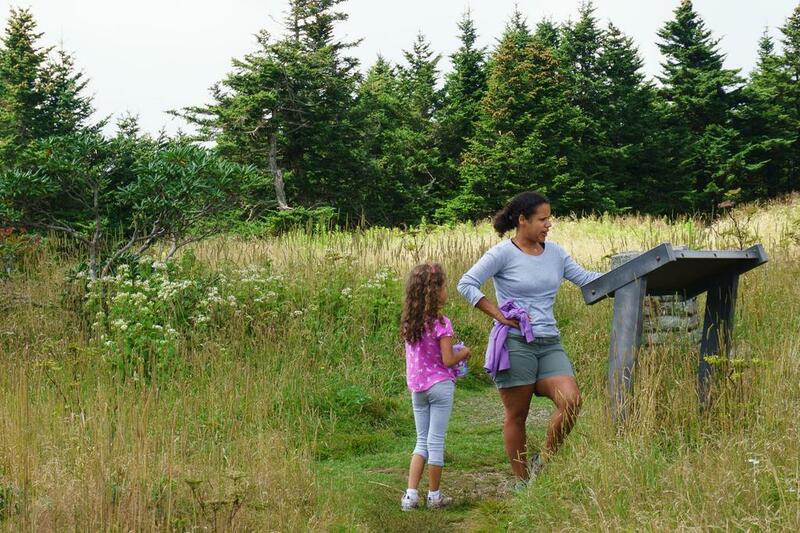 You can reach the summit of Roan High Knob this way - the true highpoint on the massif - in about 1/2 mile. Just take this trail out-and back as far as you're comfortable for a great moderate hike. More difficult hikes start at Carver's Gap and use the Appalachian Trail. For example, you can hike southwest up to the summit recreation area via the A.T., which takes a few miles of trail and nearly 1000 ft. of climb to reach. But it's well worth the effort. This stretch of the A.T. follows an old road with moderate grade and is in generally good shape. 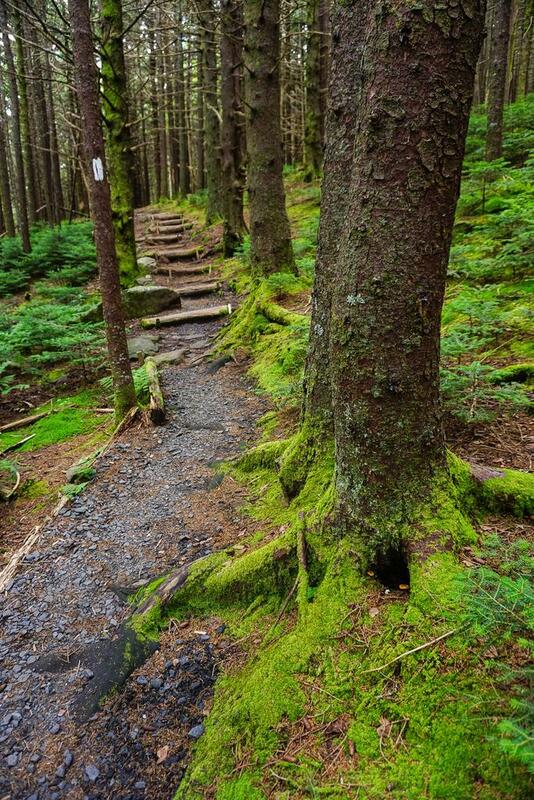 It passes through long stretches of beautiful, intact spruce-fir forests growing around Roan High Knob. If you'd like to "climb" Roan Mountain, fee-free and without parking your car right at the top, this would be the route to take. Roan High Knob, which is just a tad higher than Roan High Bluff, is also accessible this way. 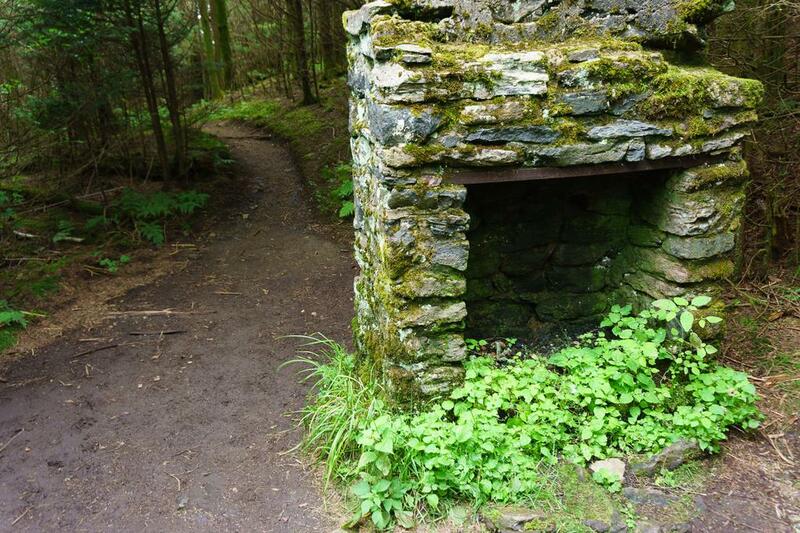 As you pass the knob, a side trail to the left directs you to the A.T. shelter in 0.1 mi. The actual summit is just uphill from the shelter. Just past Roan High Knob, you reach the recreation area. Bear left to go through the old Cloudland hotel site, and connect to the Cloudland Trail. You can reach Roan High Bluff via that trail in 1.5 miles to add some more distance to a great, moderate hike. Going northeast from Carver's Gap, the Appalachian Trail passes over a number of spectacular balds - starting with Round Bald, the easiest to reach (and most popular for that reason). But as you keep going, the crowds diminish and you reach even more spectacular balds, starting with Jane Bald. 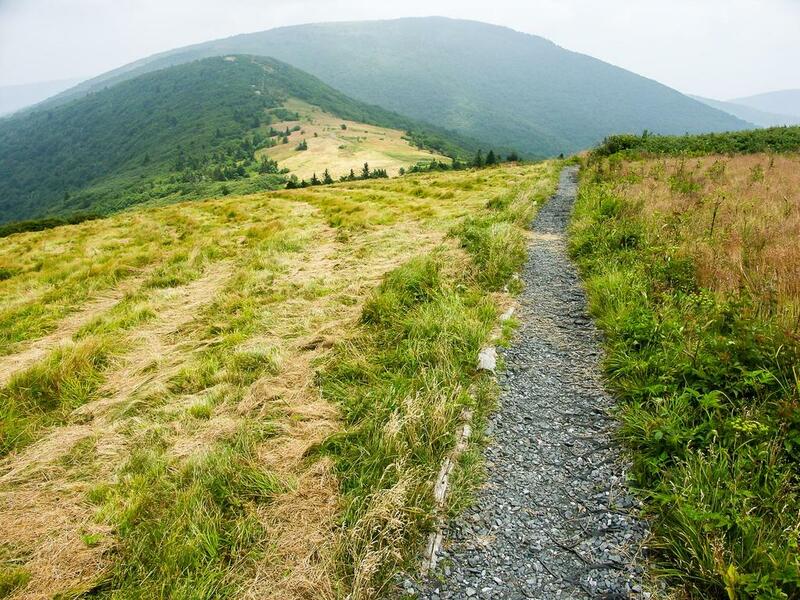 The Appalachian Trail climbs Jane Bald. Beyond Jane Bald are Grassy Ridge Bald, Yellow Mountain, Little Hump and Big Hump, to name a few. Out-and-back hikes of just about any length on this stretch of trail are highly recommend, perhaps stopping at one of the balds or gaps in between. Overnight excursions, either out-and-back from Carver's Gap or as a shuttle hike toward US Hwy. 19E and beyond, can be made on this stretch of the A.T. as well. The rhododendron gardens extend off and on all along this stretch of the A.T., so that's your best bet for a relatively crowd-free bloom viewing experience. Don't forget the blueberries which grow among the rhododendrons and ripen in mid August, and bring your camera no matter when you hike! 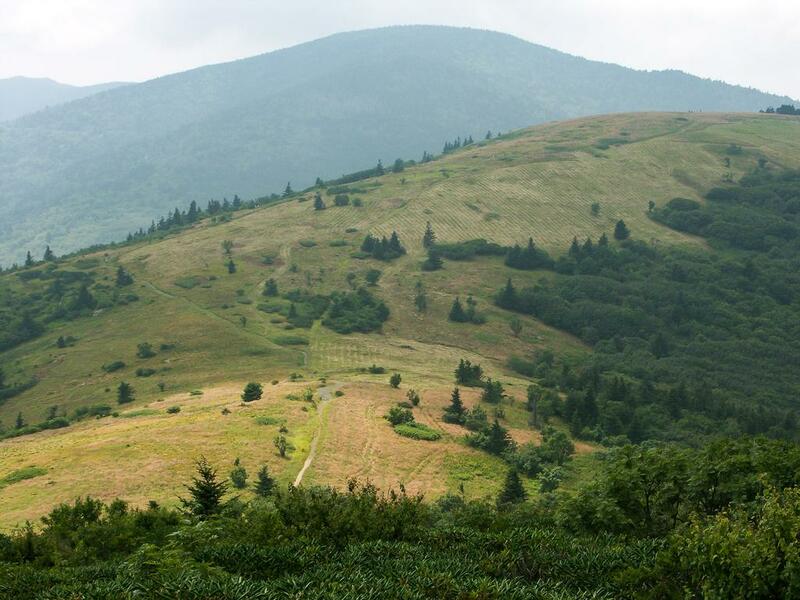 The closest place to stay to Roan Mountain is Roan Mountain State Park located at the bottom of the mountain on the Tennessee side. In addition to the camping and lodging options listed below, the State Park offers a variety of things to do including more walking and hiking trails (12 miles of them), a swimming pool, playgrounds, volleyball, horseshoes, ping-pong, basketball, softball, tennis, picnicking, a game room, and more. For more information, call 1-800-250-8620 or visit their web site. There are 107 sites with grills and picnic tables. 87 are RV sites with water and electrical hookups; the rest are tent sites with community water spigots. The bathhouses have hot showers. Thirty AAA cabins are situated in the woods of Roan Mountain State Park. Each cabin has a front porch with rocking chairs, fully outfitted kitchen, full bath with tub/shower, wood burning stove and gas/electric heat. Firewood, bedding and towels are provided by the park. While it is pretty far from any major towns, there are a variety of (good) ways to get to Roan Mountain. Carvers Gap is located where NC Hwy. 261 and TN Hwy. 143 join on the NC/TN state line. Please use a map! Straighter Route: This route is longer, but if you or your passengers easily get car sick, this is the way you'll need to go. From I-240 in Asheville, follow I-26 west to Johnson City, Tennessee (about 50 miles). Take Exit 31 to Elizabethton - US 321. Follow US 321 to US 19E in Elizabethton. Turn right; follow US 19E for 17 miles to the town of Roan Mountain. Turn right on Tennessee State Road 143, following the signs for Roan Mountain State Park. Proceed through the park and up the mountain to Carvers Gap on the NC state line. Scenic Route: This route is shorter, but much curvier with more intersections. But it also offers the chance to explore the NC mountain countryside and the charming, artistic towns of Bakersville and others along the way. From I-240, Follow I-26 west 18 miles to exit 9 for US Hwy. 19. Take US 19 north for just over 17 1/2 miles and turn left on NC Hwy. 197 north. Follow NC 197 north for just over 11 miles. There are several turns along the way; follow the signs to stay on 197. 197 will join NC Hwy. 226; turn left onto 226 north and go 3 miles to Fork Mountain Road. (Continue straight on 226 north when 197 splits back off to the right). Turn right on Fork Mountain Road and go 4.2 miles to NC Hwy. 261 north. Turn left; it is 9.2 miles up the mountain to Carvers Gap on the TN state line. Resist any temptation to use NC Hwy. 80 as a "shortcut" through Bakersville; this narrow road is so curvy it gives the Tail of the Dragon a run for its money. If you're coming from the east (I-40 around Morganton/Hickory), it may be best to use NC Hwy. 181 to NC Hwy. 194 to US 19E East, then TN 143 to the summit. An alternative, more scenic yet slightly more curvy route would be US Hwy. 221 to NC Hwy. 226 through Spruce Pine to Bakersville, then NC Hwy. 261 to Carver's gap. Follow NC Hwy. 105 S to the intersection with NC 184. Turn right; proceed through Banner Elk on NC 184 to the intersection with NC 194. Turn left; follow NC 194 for about 6 miles to US-19E. Turn right; follow this to the town of Roan Mountain across the Tennessee state line. Turn left on Tennessee State Road 143, following the signs for Roan Mountain State Park. Proceed through the park and up the mountain to Carvers Gap on the NC state line. Once you are at Carvers Gap, you can just park there for free to hike the Appalachian Trail, or turn up Roan Mountain Road and proceed 1.4 miles to the summit parking areas. There is a $3.00 fee per vehicle for parking at the summit.